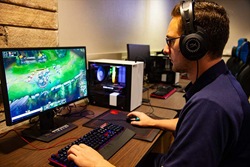 A new Esports Certificate program at the South Dakota School of Mines and Technology goes hand-in-hand with SD Mines’ esports varsity program that includes the university’s League of Legends team. At SD Mines, we prepare engineers and scientists to be excellent in all aspects of communication and strategic decision-making in a teamed environment. The South Dakota Board of Regents approved Thursday a new esports certificate program at the South Dakota School of Mines & Technology. This new curriculum goes hand-in-hand with SD Mines’ esports varsity program that includes the university’s League of Legends team. Esports is a multibillion dollar global phenomenon with a huge following of fans and players. As an example, the League of Legends world final match draws more viewers than the championship games in the NBA, NHL or MLB. SD Mines’ new 12-credit certificate in esports is designed to have STEM students gain competency in valuable skills associated with esports, positioning graduates to be more marketable within the esports industry, which is seeing strong employment growth. According to an economic impact report from the Entertainment Software Association, the video game industry is creating high-paying jobs and generating revenue for communities across the nation. Employment within the industry grew at an annual rate of 2.9 percent, more than double the rate of the U.S. job market with the average salary of $97,000 per year in 2015. But an expertise in this technology goes beyond the gaming industry. There is high demand for qualified personnel who can design, code, manage and support the infrastructure behind complex computer programs. This includes a wide range of companies that see value in personnel who are experts on these topics. The esports certificate also fits well with Mines’ Science, Technology, Engineering and Math (STEM) curriculum and the university’s effort to turn out well-rounded professionals in these fields. Video games have often been associated with negative stereotypes. But, esports at Mines focuses on the positive attributes of competitive gaming including the development of emotional intelligence, teamwork, sportsmanship, strategic thinking and communication that are required for success in both competitive sports and in the workplace. “At SD Mines, we prepare engineers and scientists to be excellent in all aspects of communication and strategic decision-making in a teamed environment. These are attributes of designers and innovators, and esports offers a venue for Mines students to hone these skills,” says Mines President Jim Rankin. In short, the new esports certificate program and the existing esports teams at Mines give the university additional ways to enhance the value of the STEM graduates we produce.